Durango Fire Protection District Chief Hal Doughty said the district plans to increase staff, purchase vehicles and remodel Station No. 3 on 32nd Street after voters approved a property tax increase in November. The property tax increase voters overwhelming approved in the November election has helped the Durango Fire Protection District move forward to hire staff, buy new vehicles and remodel a fire station. “It’s a big growth year for us,” Fire Chief Hal Doughty said. Voters across the 325-square mile district approved a property tax increase that boosted the district’s budget by about $3 million annually. The increase brought the 2018 budget up to $13.8 million and allowed the district to set aside $1.2 million for buildings and vehicles, Doughty said. Before the vote, the district had been dipping into its savings to cover operations and was unable to hire additional staff to respond to an increasing number of 911 calls. This year, the district plans to add 12 positions, staff an additional ambulance and fire engine each day, and start work to expand Station No. 3 on east 32nd Street to house more staff, Doughty said. It also plans to replace two fire trucks that are more than 30 years old. “We are trying to be smart about getting the best bang for our buck to provide better quality, faster service to the community so that they notice a difference in what it is that they are funding,” he said. One of the district’s main priorities is replacing the undersized Station No. 2 near Camino del Rio and 12th Street, better known as the downtown fire station. But the project is on hold while the fire department works to identify a site for the new station. The fire department examined moving the station to the Transit Center parking lot on Eighth Street, but it would have eliminated some parking for downtown visitors and because of its small size, it would have forced the fire district to decrease its staffing at the station, Doughty said. “We would have to downsize our operation greatly,” he said. The district also examined moving to the Durango & Silverton Narrow Gauge Railroad parking lot on the corner of College Drive and Camino del Rio, but the train decided to exercise its right of first refusal and put an end to those plans, Doughty said. Remaining options are for the district to rebuild on its current site or move to private sites. 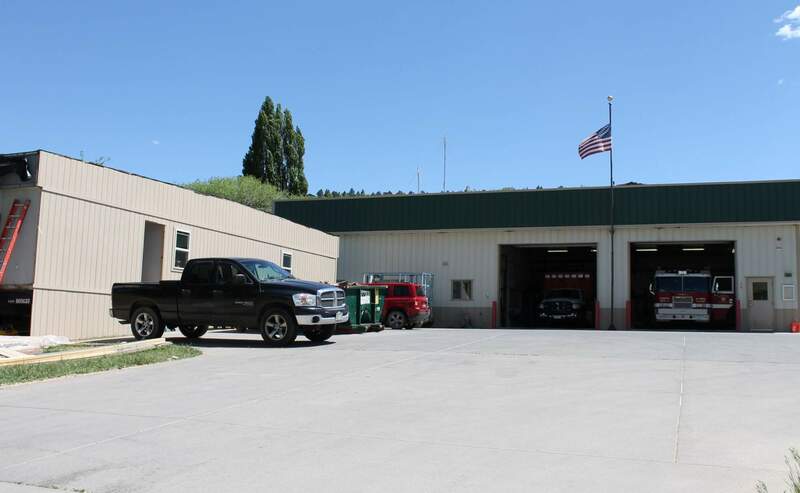 The Durango Fire Protection District plans to remodel Station No. 3 on 32nd Street on the north end of Durango. A trailer will provide temporary bedrooms for staff at the station. In the meantime, the district plans to focus on remodeling Station No. 3 so it can house a crew of four instead of two, and add space for vehicles. To make room for two new crew members ahead of the remodel, a trailer with four bedrooms was moved to the site. “The priority right now is staffing up like we said we would,” said Mike Aronson, engineer at Station No. 3. While the downtown fire station is not going to be rebuilt in the immediate future, the district will be able to staff two ambulances at the station each day instead of one, which should improve response times. 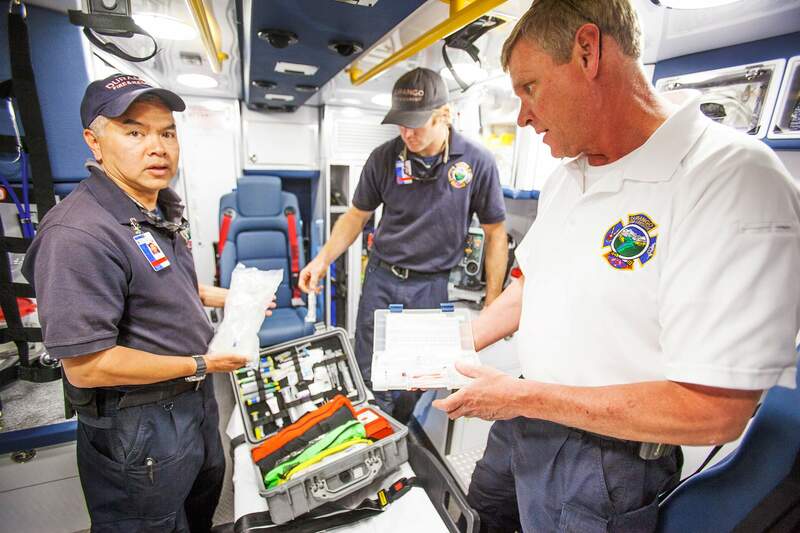 When there is more than one 911 call downtown, the second ambulance can respond instead of EMS crews stationed in Bodo Industrial Park and on 32nd Street. The downtown station responds to about 1,800 emergency calls each year, more than all the other stations. 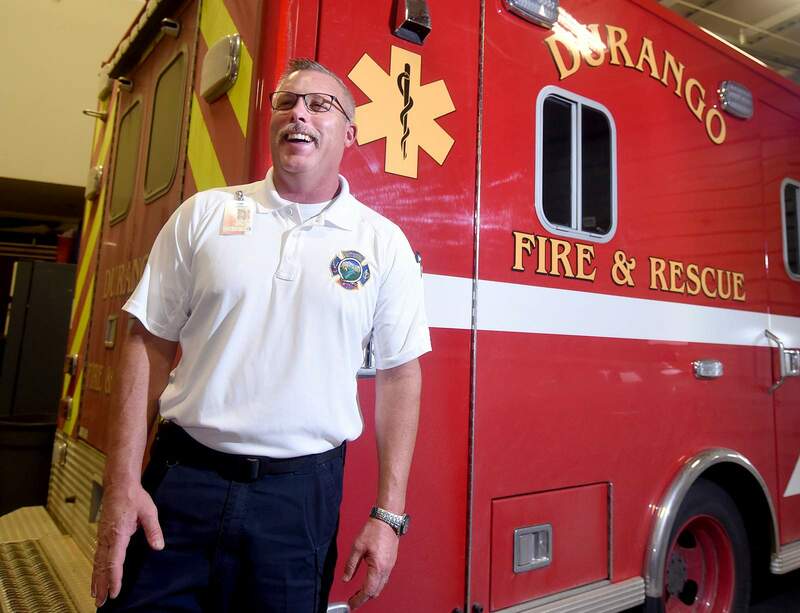 The Durango Fire Protection District plans to staff a second ambulance every day at Station No. 2 in downtown Durango. The second ambulance crew should decrease response times in the busiest area of town. This year, the district plans to add a new ambulance that will be dedicated to transporting non-critical patients to other hospitals. The district is negotiating a contract to provide the service to Mercy Regional Medical Center, Doughty said. While Durango Fire is budgeting to spend its new revenue, a state constitutional amendment is cutting into the boost in funds, Doughty said. The 1982 Gallagher Amendment requires the state to lower the assessment rate for homes when residential values increase faster than nonresidential property values. As a result, the fire district received about $1 million less than it would have in 2018 and 2019. The Gallagher Amendment is part of the reason the fire department needed a tax increase. “We just got that vote through in November, and the state’s tax laws have taken a third of that money away from us,” Doughty said. It is possible that Gallagher could continue to ratchet down residential property tax collections for the district. At the same time, the district needs to continue building new facilities, including a fire station in Three Springs and a training facility in Bodo Industrial Park. The district planned for the recent tax increase to cover 76 percent of the district’s needs over 30 years and for fees on new construction to cover the rest, because every new hotel and housing project adds to the number of potential emergencies the district might have to respond to, he said. Taxpayers who already live in the area shouldn’t have to cover the costs associated with new growth, he said. Durango City Council and La Plata County commissioners would have to approve those fees. But for now, the district is not actively lobbying for those fees while the county is busy working on a land-use code rewrite and the city tackles a myriad of other issues. “I feel like it’s important for the fire department to be a team player,” Doughty said.